The Bombardier Global Express XRS offers business travelers international-range to deliver non-stop service to much of Europe, South America, and Northeast Asia from California, and with a modern, spacious, and quiet interior. Regarded as the most luxurious business jet on the market, the Global XRS exudes comfort, performance, and features that create an uncompromising travel experience. Offering an expansive 48 feet of interior space, both of our Global aircraft provide complete passenger customization through the use of an iPod Touch at every seat to control the environment including lighting, window shades, temperature, entertainment, and more. With flexible wing construction affording one of the most comfortable rides in rough air of any business aircraft, as well as a pressurization system that maintains cabin altitude at 4,500 feet to greatly reduce passenger and crew fatigue, and an enhanced design for minimal cabin noise, a seamless and enjoyable flight is provided, every time. On our Global N64NY, a fully equipped galley, that supports fine dining, and a crew rest area accompany three additional distinct cabins. 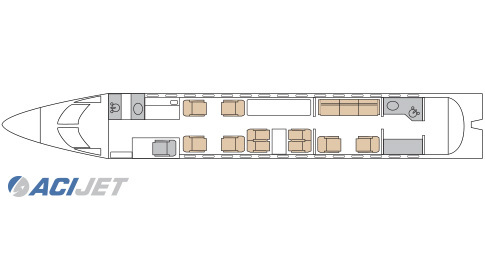 This jet will accommodate 13 passengers, with the forward cabin featuring a double club configuration, the mid-cabin offering a four-seat conference layout, and the fully private aft cabin featuring a divan opposite two individual seats. 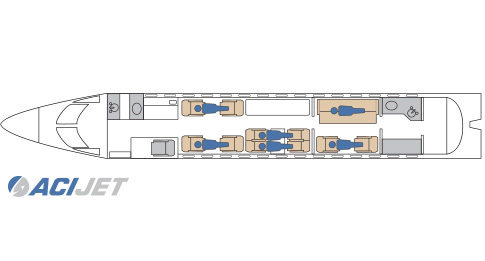 The aircraft offers forward and aft lavatories, and can be berthed to accommodate 6 sleepers for ultimate relaxation. This Aircraft is Wi-Fi Equipped. *All speed/ranges are effected by weather, passenger count, runway length, and prevailing winds.